At Teton Family, we support our vibrant mountain culture through content suited for practical, modern families. From usable information for the harried parent, like lunchbox meal plans, to in-depth health articles, like the dangers of parabens, to seasonal food and garden recipes, our magazine combines useful information with local sources—giving our community a holistic go-to. 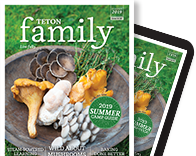 Teton Family is a shoulder to lean on when readers need advice on how to navigate the teen years, inspiration for a new home craft, or where to go to get the freshest foodie finds. Tune into our weekly blog posts and Facebook page for discussions on family life, food, garden, health, crafts, recreation, and natural living. When Christina Shepherd McGuire’s not whittling away at words, she’s helping cool companies build their brand experience. She writes about adventure sports, mothering, natural living and fashion. Her works appear in Action Outdoor and Bike Magazine, Transworld Business Magazine and online atTypeF.com (Tyra Bank’s website), The Nest and The Bump. Check out her exploration of adventure living, creative work and modern mothering at www.skirtingseason.com. Kathryn Holloway graduated from the University of Missouri with a degree in journalism and an emphasis in magazine design. Currently, she is the head designer at the Jackson Hole News and Guide and works on special projects like the Fall Arts Festival, Jackson Hole Compass, and the Town of Jackson Centennial Magazine. When she’s not designing for the newspaper, Kathryn enjoys backpacking, traveling, and running her small business, Lovebird Paper. Kal Stromberg has been a part of the Jackson community for ten years. He studied advertising and geography at the University of St. Thomas in St. Paul, MN. After bouncing around the West he landed in Jackson to work in Grand Teton National Park and found what he was looking for. Following a winter bumping chairs and tasting Teton pow there was no looking back. 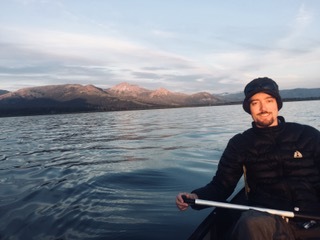 Kal enjoys adventures with his wife Beth, backpacking, canoeing, mountain biking, hunting, soaking, eating, and skiing.